On one of her biweekly visits my mother told me about what had happened to her, to Ferdi, Max Fingerhut, his best friend, and my Uncle Nuhim. My mother had found work in Brussels doing I don’t know what. She and Ferdi had also found an apartment. Both of these were feats, as Belgians were forbidden to either rent apartments to Jews or to give them work. One day, while on her way home from work, just before she reached her building, several neighbors who recognized her and were leaning out their windows, waved her off, signalling she was not to continue on her way home. From a distance, she saw that there was a German soldier on guard duty in front of the building, and it didn’t take long to find out that both Ferdi and Max had been arrested and taken away, probably to Maline. Neither of them was ever seen again. In addition to now being heartbroken, she also had the practical problem of where to spend the night, returning to her apartment being out of the question. As her sister, Paula didn’t have a telephone (they were scarce in those days) walked to her sister’s house and asked her whether she could stay overnight. Her sister, however, fearing for her own family at first turned her down. It was just too dangerous if the Gestapo was after my mother. My mother pleaded, and Paula relented, and allowed her to spend the night. During the night there was a loud banging on the downstairs door, and none of them had any doubt about what it was. It had to be, and it was, the Gestapo, who immediately asked for my mother. Being told that she wasn’t there, they began to search the apartment. They looked everywhere they could think of, but found nothing. They went into the bedroom, the dark one without electricity and over Emile’s coal store, couldn’t see much, and were about to leave, when one of them looked under the bed. There was only the narrowest space between the bed and the floor, but everyone was skinny in those days. My mother had crawled under the bed, into the furthest available corner. She saw the Nazi looking for her, but he did not see her. He got up and returned to the other room. As they were about to leave, the leader of the group, in the usual leather coat and fedora, gave my aunt a stern warning about what would happen to her if my mother were to be found on the premises, and then left. The relief of everyone present as my mother crawled out from under the bed can be imagined, especially after the terror that had preceded it. The Nazis hadn’t taken anyone, and my mother hadn’t been arrested. But now the problem was the same as the day before, where was she to stay tomorrow? Ferdi was gone. So was Max. She had no home, no money. The Gestapo was looking for her in Nazi occupied Brussels. The situation was terrible, but she was alive and she was not on her way to Maline. we need more of these personal accounts to be documented and recorded. I thank you and your mother for your bravery in doing this. 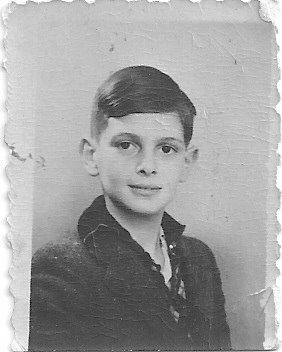 My father was born in a work camp, and somehow maned to survive the HOLOCAUST along with his father and mother ( although his father’s 10 sisters and brothers and parents were all put to death by the Nazis. I wish he and my grandmother would be more forthcoming about what they went through but they have never spoken of it…I can’t imagine the harrowing experience and again thank you for putting a face on a tragedy that is becoming increasingly more faceless as the years go on. Melissa, thank you for your interest in these little stories. Your father is probably younger than I am, and his memory of the events may just not be as clear as mine, which might be one reason for not talking about it. The other reason could be that the experience was just too horrific to be remembered or discussed with any pleasure today. Some things are better left in the dark. My own mother, after the war, refused to attend funerals. She’d just had too much of death and mourning. As for me, as a child, I was sort of marginal to the whole experience, aware of what was happening, but somehow detached by my own relative safety. And I can write about it simply because I didn’t feel fully involved, not in the way the adults were who had to live in hiding, terrified , with near death experiences a regular part of life.